Aireborne Theatre's "Alcatraz" poses significant difficulties for anyone wishing to review it. Some shows by their very nature are best experienced by an audience that has little advance knowledge of the piece - something we achieved by accident rather than design as the show was a late replacement in our schedule for the day. But it then leaves me wanting to give a flavour or sense of tone for it without giving too many pointers. Please bear in mind that reviews elsewhere may be less circumspect. You like theatre that is, in the best sense of the word, 'artistic'. You don't mind being halfway through a show and not being at all sure what's going on (as long as it makes sense by the end). You have a bit of free time afterwards to have a think about it before your next show. You want to turn your brain off for a bit and just be entertained. You are already seeing a lot of 'complex' shows today. You want plenty of laugh out loud moments. You have been to San Francisco/Alcatraz and found the title intriguing. I really enjoyed it and despite not being entirely convinced by the central conceit, it kept my attention throughout and showcased some strong performances. Waldorf on the other hand wasn't quite in the right frame of mind for this one and it struggled to really pull her in. 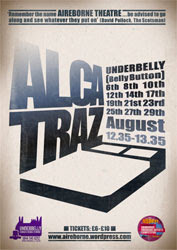 Alcatraz runs at Underbelly at 13:25 on the 10th, 12th, 14th, 17th, 19th, 21st, 23rd, 25th, 27th and 29th.